...R de Rose revives the quintessential elegance of rose with a light, fruity facet of raspberry. A scent that will surely make you pause and smile. 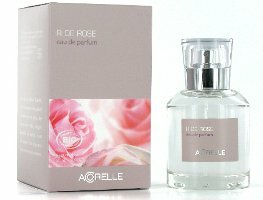 Feminine and romantic, yet youthful and spirited, R de Rose embodies a classic floral with an unexpected freshness and a sparkling edge. The lovely top notes of Bulgarian rosebuds and Egyptian geranium calm and soothe the mind, while freesia and raspberry base notes increase a sense of well-being. R de Rose is an exquisite, sophisticated scent for today’s cosmopolitan woman. Achieve harmonious calm throughout the day as the scent lingers, like a childhood memory of spring. Not a bad price for an organic EDP. This line is available at FourSeasons correct? Has anybody ordered samples from them before? They are not available online. Well, the rose and raspberry certainly makes me pause. Not so sure about smiling, though–not a fan of the raspberry. Sounds like a very nice line, though. I love rose + raspberry in Parfums de Nicolai Balkis though! The price is lovely, however the raspberry concerns me. Rose is something that I like when it’s handled just so and the inclusion of raspberry makes me think this might be a bit too sweet. Also, being touted as being ‘youthful & spirited’ … isn’t everything these days? I feel like as a younger woman I’m expected to smell like crystallized fruits or a strong burst of citrus & Lysol. Raspberry (and many jammy fruits) go so nicely with rose though. Drole de Rose, Balkis, many others. And isn’t it a weird day when it’s *me* that’s sticking up for fruity, LOL? Well, and that just made me think of BK’s Liaisons Dangereuse, which I love–also a jammy, plummy rose. Yum. Ok, so you never know. I’m just raspberry-phobic. You and me, both. While one of my absolute favourite fruits, I just don’t fancy it much in my perfumes. Sublime Balkiss is a great scent — do try it!